Summer time is all about grillin and let me tell you, I’ve really embraced that this year. I always left the grill cooking up to the men but now it’s my turn and I am loving it! Which is why I’m sharing with you my most recent culinary masterpiece! 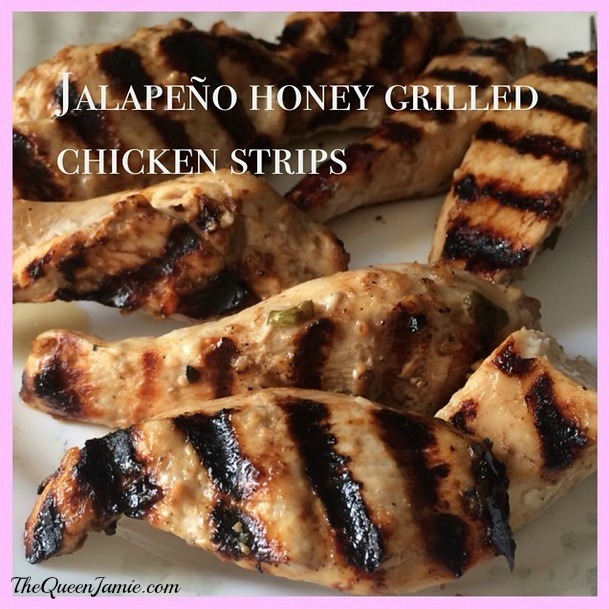 Jalapeno & Honey Grilled Chicken Strips. Oh My God they are wonderful. The great thing about this recipe is that it can so easily be tweaked to fit your own taste preferences. Which is exactly what I did, this recipe was one I found on the internet and changed up a bit. (See the original here.) You can make these as spicy or mild as you like. The recipe I used created chicken strips with a mild little kick. (basically a child could eat these.) If however you want a more spicy kick just add more jalapenos and leave in more of the seeds. I removed all but a few seeds in mine. 1. In a bowl combine honey, olive oil, garlic, chopped peppers, lemon zest, salt and pepper. Add the chicken, cover and place in refrigerator for about 2 hours. 2. Pre-heat your grill on high and thoroughly oil the rack. 3. Lay chicken strips on hot grill “nice” side down. (The side that used to have skin) Close the lid and let cook for about 2-4 minutes. Then flip and do the same. Make sure you test your chicken by cutting into a large piece. The juice should be clear and the meat should be white with no pink left. 4. Sprinkle with fresh cilantro (or whatever herbs you like) and serve with a bit of sour cream. Delicious! Want more recipes like this? Leave a comment below and share this one with your friends!